SKU: N/A. Categories: Drawing & Sketching Paper, Sketch Books. Tags: back, book, hard, sketch, Winsor & Newton, wire-o. These sketch books are made with 110gsm acid-free paper, to ensure longevity. Each sheet is perforated along the edge to allow for easy removal. They are suitable for use with pencil, pen and ink and light water colour washes.These high quality black case bound hard black sketch books are available in two styles; one is case bound with a classic leather effect black cover and the second is a wire-o style hard backed sketch book. 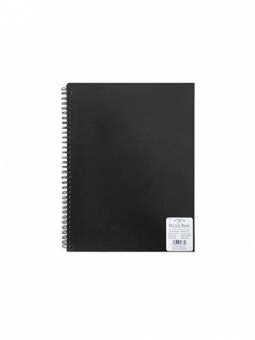 Both styles contain 80 perforated sheets of 110gsm cartridge paper.